Before you get started with cMap, you need to make sure you have Connections installed and setup. If you have not done this already, please take a moment to read and follow the QuickStart. Installing the cMap template is just like installing any other plugin. Please follow the detailed template installation instructions. In order for maps to load on your site you will have to setup Google Maps API keys. Here’s how to setup your Google Maps API keys. Navigate to the Connections : Template admin page. Find the cMap template under the Available Templates section. Find the cMap template. If you have activated it, it will be at the top of the page. If you have not activated it, it will be in the Available Template section. After you enter the Template Customizer you will have over 100 interactive point and click options available which will allow you to tweak the template to better accommodate your needs and style it to better match your theme. Global Options :: Options such as those relating to the character index. Changing these options will affect all templates. Search :: Choose whether or not to display keyword search control. Category Select :: Choose whether or not to display the category drop down and whether or not the category counts or empty categories should be shown. Pagination :: Chose whether or not to enable pagination control, where to display it and change the number of entries displayed per page. Display :: Allows you to choose which element/fields to display. Style :: Provides options to control the card color, text color and whether or not to display the gradient and/or drop shadow. Image :: Choose which image to display, set its size and crop mode and more. Bio Tray Image :: Choose which image to display, set its size and crop mode and more. Map :: Whether or not to display the map. Strings :: Customize many of the template specific strings. Advanced :: Many advanced options such as name and address format. The results card view and the profile detail view can be configured independently. To configure the profile detail view, click any entry name. After you have completed, click the “Go Back” link to get back to the result list card view. In addition to the ability to be customized by the Template Customizer, cMap provides a large array of shortcode options. The available shortcode options are, for the most part, exactly the same as those that are available in the Template Customizer. These allow you to use the Template Customizer to change the template options globally and the shortcode options allow you to override those global options per shortcode instance. Here are a couple quick tips on working with shortcodes, useful not only for the Connections shortcodes, but for all plugins that use them. First, always switch the post editor to the Text tab. Second, never copy paste them from a website. It is always best to manually type them out. That should solve and help prevent many issues when working with shortcodes. All shortcode options will affect both the results list card view and the profile detail view. The background gradient and background color can be turned off and the color changed. Change the background color from grey to a light blue with gradient. Keep the light blue background color without the gradient. Keep the default grey background without the gradient. Remove the background color and gradient. The background_color option accepts any valid CSS color. If you wish to not display the keyword search use the enable_search shortcode option. To remove the searchable category drop down use the enable_category_select shortcode option. Any categories which are “empty” will not be displayed in the category drop down. Empty means no entries have been assigned to that category. If you like to show empty categories, the show_empty_categories shortcode option can be used. You can also choose to show the number of entries assigned to a category in the drop down by using the show_category_count shortcode option. NOTE: The entries in the moderation queue will not be included in the count. The category drop down will automatically show all categories. You can use enable_category_by_root_parent option to limit which categories are shown in the drop down by limiting the drop down to specific root parent categories [see definition of root parent category]. This is very useful if you want to create multiple directories. 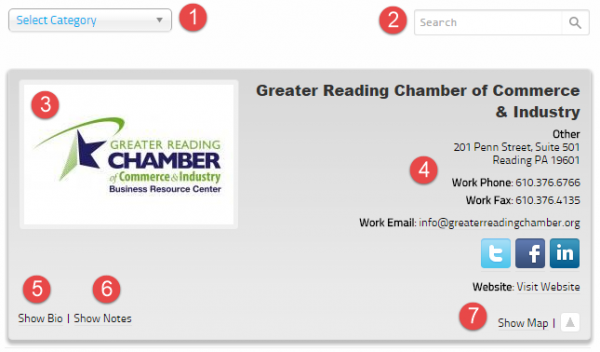 For example on a chamber of commerce site you could show a directory business members on one page and on another page a directory chamber officers with all entries managed by a single installation of Connections. See this FAQ for an example of how to use this option. DEFINITION: root parent category – This is a category that is not a child of another category. NOTE: This option must be use with the category shortcode option. To disable the pagination feature use the enable_pagination shortcode option. When pagination is enabled, the page control will be displayed after of the result list by default. You can change the position to have it shown before the result list or in both positions. If you would like to change how many entries are shown per page the page_limit shortcode option can be added to the shortcode. To change the results per page to 10 this is the shortcode you would use. NOTE: The show_family will only have an effect if the entry type is a family. The name shown will be the full name of the entry including the prefix, middle name and suffix. This can be configured by using the name_format shortcode option. The name_format option accepts only a few specific tokens. A token is a word wrapped with the % symbol, for example, %first% is a token. NOTE: The name format will also be used on the entry’s profile detail page. Click the Customize button for cMap. The page will reload with the Customizer on the left and a preview on the right. Click the back arrow in the upper left of the Customizer. Change the strings as desired. Click an entry name in the preview. The preview will reload displaying the entry detail profile page. Make the same changes again. This is required because the results list view and the profile detail view can be configured separately for greater flexibility. Click the Save and Publish button and then exit the Customizer. Alternatively, you can change the template specific strings in the cMap template by using the Say What? plugin as outlined in this QuickTip. Following the instructions given in the QuickTip will change the strings wherever they are used throughout all of Connections and within the cMap template. The text domain for the address, phone and email labels will be connections. * Example 3: You can add as many strings as needed. Rather than explain each of these above options individually we’ll go over the addr_format shortcode option since all are used the same way. The addr_format option accepts only a few specific tokens. A token is a word wrapped with the % symbol, for example, %label% is a token. NOTE: The %label% will be the address type. When processing the display of the address, Connections will scan for each token and replace it with the corresponding address segment. Each token should only be used once even though you could use each token more than once, but that is not recommended. The block layout is achieved using CSS which can easily be overridden to make the address segments display inline. How to override the CSS is a separate topic. This will display the address minus the label and country fields. This will display the address with the state and city switched, which is common in many parts of the world. Rather than explain each of these above options individually we’ll go over the address_types shortcode option since all are used the same way. The address field has the Type option when adding an address. The default choices are: Home, Work, School and Other. It is possible to limit the output to any combination of these address types regardless if an address is entered for an address type or not by utilizing the address_types shortcode option. Show only the home address type. Show only the work address type. Show both the home and school address types. The examples demonstrate the address_types shortcode option. This is likely being caused by the theme including a “buggy”, in my opinion, HTML5 shim script. The purpose of these shim scripts is to enable HTML5 features in browsers that do not support them. They work pretty well … but, there seems to be a bug in this shim script. When you click on a category, the “Search” placeholder string in the search box is being sent as a search keyword term. So you’re actually searching for “Search” within the category being selected. Obviously not what we want to do. The fix will be to remove the “Search” placeholder text. To do this easily, we can use another plugin. Changing the search string can be done with the Say What? plugin. It’ll add a new Text Changes menu item under the Tools admin page. Click Add New, enter the string exactly as shown in Connections, Search. Next enter connections (notice the lack of capitalization, that’s important!) as the domain and then enter your new text. In this case leave it blank. Why doesn’t the map work? 1. The theme does not have the wp_footer() template tag in its foot. If the theme does not have this, it will break many plugins that require it. 3. The theme or another plugin is also queueing the Google Maps API. When it is loaded more than once, it will often times fail to function correctly. If that is the case, try unchecking the Google Maps API option on the Connections : Settings admin page under the Advanced tab in the Compatibility section. To embed videos in to the bio and notes field you must use the WordPress shortcode. The examples show only YouTube and Vimeo, but any of the sites that the shortcode supports can be used. If you would like to embed a video that pops using a lightbox effect, use the WP Video Lightbox plugin instead of the shortcode. Can I use cMap on two different pages showing different categories in the drop down? Sort of, you can limit the list to specific root parent categories. What is meant by root parent is that the category is not a child of another category. This can be done by using the category shortcode option and a cMap enable shortcode option, enable_category_by_root_parent. Here is an example that will only show the root parent categories 2, 5, 12 and their children categories in the drop down. The manner in which this plugin alters the outgoing links seem to make the links for both the bio and notes none functional. Currently the only solution is to deactivate this plugin. When both cMap and WP Flexible Map are installed on the same site the directory page using the cMap template will no longer function. 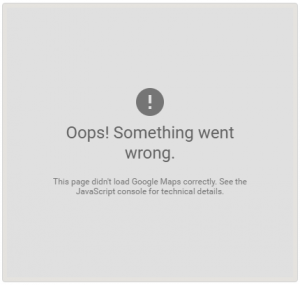 The issue is usually caused by the Google Maps API being loaded on the page twice. cMap will load it only on its page in the page footer. Mapping plugins should do the same, but some, like WP Flexible Map, load it on every page regardless if there is a map or not. This of course causes the Google Maps API to be loaded on the cMap page twice which can break the API. The solution is to use a mapping plugin which will load the Google Maps API only on its pages. One such plugin recommended by a user is Robo Maps. The author of the theme uses a different jQuery plugin to customize select boxes, to which they have set to affect all select boxes globally within the theme. In my opinion, not a smart way of doing it because it’ll affect any plugin that happens to output a select box. There are two fixes, both of which may not be ideal. The first, you could disable the the jQuery plugin the theme uses. The downside, no select boxes in the theme will be enhanced other than the one in template. The second solution would be to disable the jQuery plugin in the template. The downside here would be threefold, you would loose the inline search for categories, the select box will be blank until clicked and the categories will loose their hierarchical appearance. I, obviously recommend disabling the theme’s jQuery plugin but I’ll give you the instructions for both. NOTE: Before following these step, check the theme’s settings to see if there is an option to turn this off. 2. On line 14 add /* to before the $. 3. On line 17 add */ to after the });. 5. Upload it back to the originating folder overwriting the original file. 2. On line 79 add // to before the $. 4. Upload it back to the originating folder overwriting the original file.